Samsa Khatun is a happy woman today. When Shri Sanjay Kumar Pandey, Block Development Officer of Mainatan block in West Champaran, assured her that the installments which had stopped coming under the Indira Awas Yojana will again resume within a couple of days, she felt the pall of gloom lifting off from her. And she has only the Soochna Seva team to thank for this miracle. Merely a few weeks before she met the BDO, it was a different story for Samsa Khatun. Samsa lives in Pidri with her three children aged 8, 11, and 14 years. 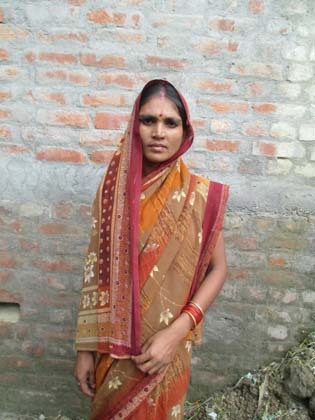 Both Samsa and her husband, Amin Miya are daily wage laborers and barely earn enough to make ends meet. Even though both are illiterate they have dreams to provide a good education to their children and to provide a more comfortable like to their chidlren. All her three children studies in a nearby school. Amin Miya works outside their village and comes home only once in 3 to 4 months so that he can save some money for their dream house. For him, being with his family meant an expense that takes him and wife further away from their dream of providing for a better life for their children. Samsa’s husband, a BPL card holder, applied for a pucca house a year ago. When the first installment of Rupees thirty-five thousand, their joy knew no bounds. They constructed their first pucca wall for their house. Their installments, however, suddenly stopped coming after the second one without any prior reason or warning. Their dreams of living in a pucca house, thus, remained unfulfilled. It was during one of the house surveys that the Soochna Seva conducts that Samsa met the team. When she learned that Soochna Seva’s key objective is to help people like her in accessing Government schemes and entitlements, she poured her heart out to the two young and energetic Soochna Sevaks Akshay Kumar and Amlesh Kumar. After hearing her out, the two Sevaks immediately took her to Akhilesh Ram, the ward member of her village, and narrated her incident. Soon, they all sought an appointment with BDO Sanjay Kumar Pandey. The BDO saw that there was no reason for the installments to stop and he immediately announced to the team that the installment would resume within a few days’ time. And true to his word, the installments for the house started again. And so has Samsa’s happiness too.